The craziest thing happened on my last trip to New York City. It was a Tuesday evening, and I’d met some colleagues after work for drinks at a bar. It wasn’t a particularly notable place, somehow both bland and exotic in the way that midtown bars tend to be. We ordered a round of beers. Then another. It was on drink number three that the night took an unexpected turn: The bartender bought us a free round. Just gave the damn thing away. It only got weirder from there. When I looked at the final tab, I noticed we’d been charged $2 less per beer than the stated price on the menu. Wait until Yelp hears about this, I thought. As the night progressed, something further confounding transpired. Despite the fact that a group of adults had consumed alcoholic beverages at a slightly discounted price, we all managed to make our way out of the bar, into our cabs and Ubers, and back home without falling into any open manhole covers or fist-fighting a Duane Reade cashier. Only in New York, baby! It was only later that I learned I’d been party to one of the most glorious schemes heretofore devised by man or devil: happy hour. Unfortunately, for more than 30 years this hedonistic après-work ritual has been outlawed in Massachusetts due to a (fully priced) cocktail of fear over excessive drinking, good old-fashioned Bay State Puritanism, and a stiff pour of business lobbying. While the happy hour ban may have made sense when it became law in 1984, the state, and Boston in particular, have changed immensely during the intervening years. We raised the drinking age. We card more aggressively. We have Uber. We have vastly fewer car accidents. I know it sounds far-fetched, but there are people—dreamers, if you will—who believe that happy hour could once again work here in Boston. Our municipal infrastructure and moral character, they claim, will not collapse into the Charles River in a deluge of $4 Harpoon IPAs. We have good reason to listen to them. Today, leaders regularly proclaim our bona fides as a world-class destination, but Boston’s lack of happy hour makes us look, well, bush league. Drink specials are legal in most of the U.S., putting Massachusetts in an elite minority that includes such buzz-kill nanny states as Indiana and Utah. Recently, Governor Charlie Baker boldly stamped out a blue law that had been around for more than 80 years outlawing liquor store sales the day after Christmas when the holiday falls on a Sunday. It was a good move, but if we want to remain a first-rate city and keep pace with other innovation boomtowns such as San Francisco and DC, it’s high time we ask: Why can’t we have happy hour, too? 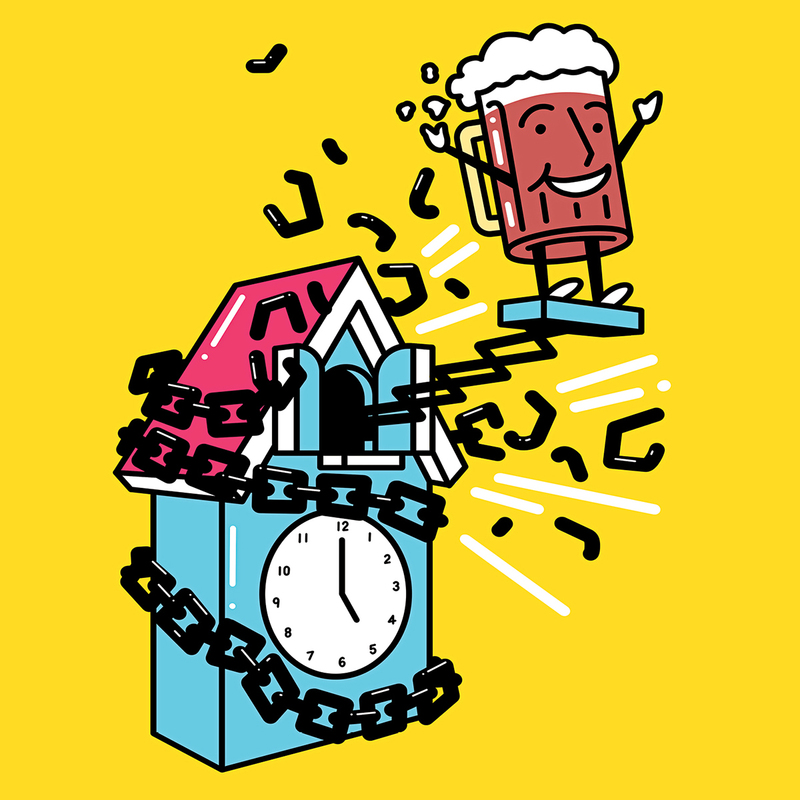 Given our reputation as a hard-drinking town, it’s curious to visitors, transplants, and plenty of longtime residents that happy hour is illegal here in the first place. Like most moral-panic laws, the origins of the ban can be traced to a particularly tragic incident. In 1983, a young woman was killed when she was run over by her friend in the parking lot of a Braintree bar. The friend, it was found, had been drinking discounted beverages at happy hour. After the woman’s death, the Massachusetts Alcoholic Beverage Control Commission (ABCC) conducted hearings throughout the state, with testimony from license holders as well as the public. Mothers Against Drunk Driving (MADD) and others dug in. The following year, the legislature enacted happy hour regulations, which remain unchanged to this day. The law prohibits a licensee from offering free or discounted drinks, unlimited drinks, stronger drinks, drinks as a prize or promotion, or more than two drinks to a person at a time. And just like that, no one ever got wasted in Massachusetts again. To be fair, the awareness campaign—led in large part by MADD—has significantly transformed the culture-wide attitude about drunk driving, a shift that has saved countless lives. Since happy hour’s banishment from the state, drunk-driving fatalities in Massachusetts have dropped from 411 in 1984 to 154 in 2014. But this decline is not a phenomenon isolated to Massachusetts; it’s part of a national trend that includes plenty of states where happy hour remains legal. Despite the steep decline in drunk-driving deaths, MADD remains staunchly against a return to happy hour. It wasn’t just moral and safety concerns that outlawed cheap drinks on workdays from 5 to 7 p.m., though: Bar owners and restaurant lobbyists hated happy hour, too. As an ABCC report from 1984 noted of its hearings: “[Many] license holders testified that they were ‘sick of happy hours’ and provided them solely because of competition.” The argument back then, which is still trotted out whenever the issue comes up, is that happy hour will result in a “race to the bottom,” with drinkers racing to get to the bottoms of their glasses and bars racing to undercut one another’s prices. As the thinking goes, if you let a bar discount a drink and customers start flocking to that bar because of it, then it naturally follows that its competitor next door will be forced to discount its drinks even further. Suddenly bars will be paying people to come in and take the booze off their hands just to stay afloat. sam davidson, cofounder of an app called Cheers, which brings groups of people together for friend-dates and offers complimentary drinks as an incentive, is one of the dreamers who does. At the end of June, Davidson, a 27-year-old Boston University graduate, registered the domain happyhourboston.com and launched a petition in an attempt to bring the ritual back to our city. It was quickly signed by more than 10,000 people. Since Davidson launched his petition, nearly every publication in the state has chimed in, and more than a few bar owners and bartenders are, thankfully, beginning to brainstorm ideas for how to make this nutty proposal work. After all, if we can dig a multibillion-dollar hole through the heart of the city, actually convince people to hang out on the waterfront, and even turn Somerville into a fancy-dining mecca, finding a way to sell a few cheap drinks should be feasible. Evidence suggests that Boston’s approach to drinking (and serving) is far more responsible than it was in 1984, the year we banned happy hour. For one thing, the drinking age is higher—we raised it from 20 to 21 in 1985. It’s also a lot tougher for underage customers to get served these days: IDs are trickier to forge, and the notoriously laissez-faire Boston bars of yesteryear are under more pressure than ever to card young patrons aggressively, thanks to ABCC crackdowns. Not only are we drinking differently, we’re also getting around the city differently. And it’s here that the staunchest opponent of happy hour could also be its inadvertent ally. MADD spokespeople have long made the argument that with “so many options available, there is no reason for anyone to drink and drive in a city like Boston.” Okay, the T may not always be the most reliable, and late-night service was just scuppered again. But never before has it been easier to summon a designated driver. With the explosion of ride-sharing services such as Uber and Lyft, it’s no stretch to say that our increased transportation options are a strong argument for taking a hard look at happy hour laws once again. Davidson says he’s received inquiries from the mayor’s office and feels optimistic about the Walsh administration’s recent efforts to loosen some of the city’s outdated drinking prohibitions, such as pushing for later closing hours for bars. But he certainly has his work cut out for him if he expects his petition to go anywhere. Any changes would have to go through the ABCC, which declined to comment for this article, and would require legislative action—neither of which seems likely any time soon. It’s a shame, because we’ve made so many other positive changes in our city recently. Thirty years ago, the happy hour ban might have been one of them—but in the intervening decades, we’ve cleaned up our act. It’s finally time Boston gets a buyback.